We first came across home product design company, Buster + Punch, a number of years ago when they had just moved into their “long-term pop-up” (as it was then described) showrooms in The Hop Exchange in London Bridge. We’re not usually the types to get overly excited about light switches and bulbs, but these guys had us running around their shop floor like greedy children wanting one of everything. Amazed by their rock n’ roll, bad boy design style, fantastically cool and original products, and laidback attitude, we fell a little bit in love. So, when we heard that they were behind the design of Arthur Hooper’s – a restaurant overlooking Borough Market – we just had to check it out. Locations don’t get much better than this; the 51-steater venue sits next to the bustling Market Porter Pub and opposite the Stoney Street entrance to Borough Market. As we walk up to the entrance, we are greeted by friendly members of staff who usher us inside. 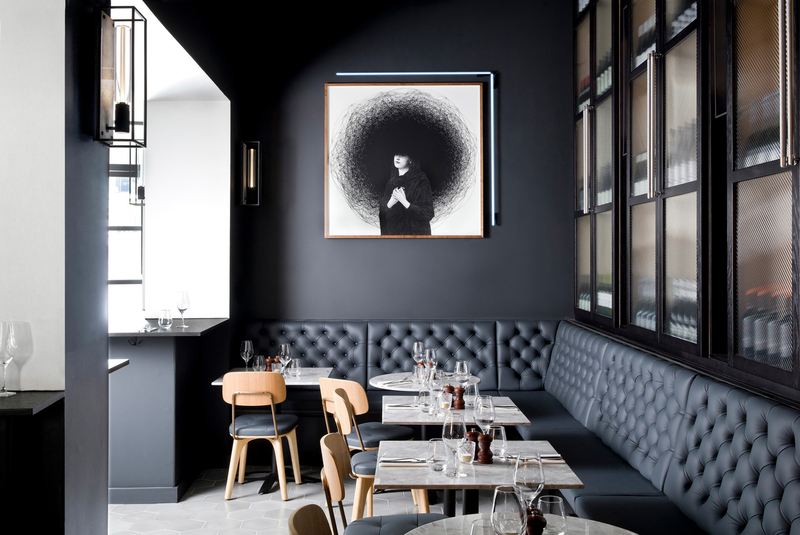 The interior is sleek, monochromatic and contemporary in a way that nods at classic rock n’ roll design heritage in the most grown-up of ways. Set partially under a bridge arch, the main seating area benefits from a curved ceiling, rounding off to join a wall adorned with tall, dark wood and frosted glass cabinetry, housing a regimented platoon of wines. 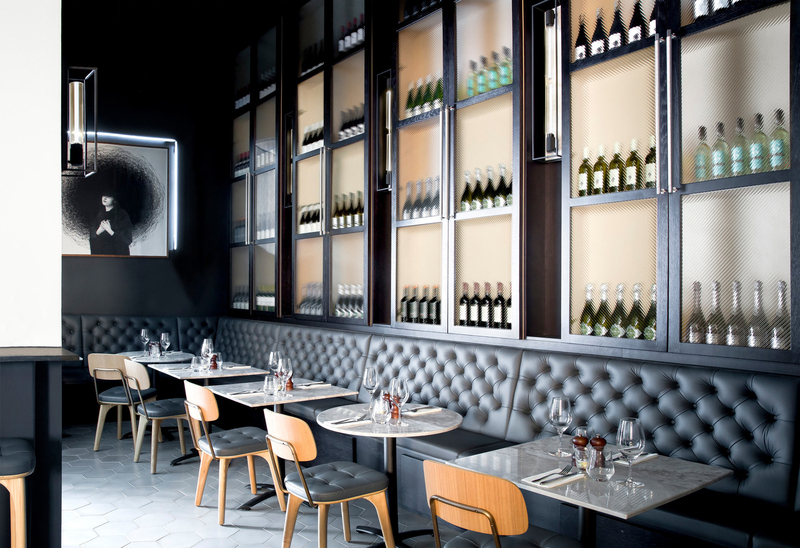 Dark grey banquettes sit below this display, whilst elsewhere seating is made up of stools lining the bar and perched around shelf tables. The atmosphere is relaxed, intimate and engaging. 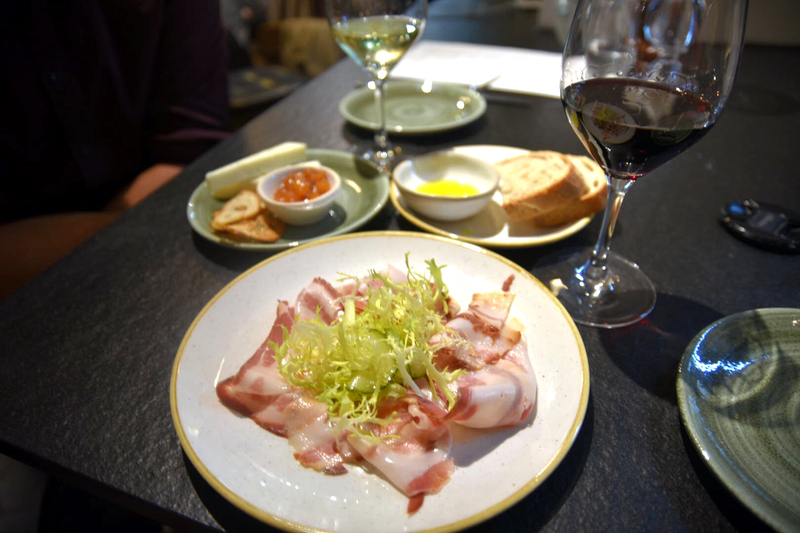 We are handed two menus: one announcing an array of cheeses and cured meat, followed by a selection of European small plates meant for sharing; the other presents us with a dazzling choice of some 50 wines from vineyards around the globe. 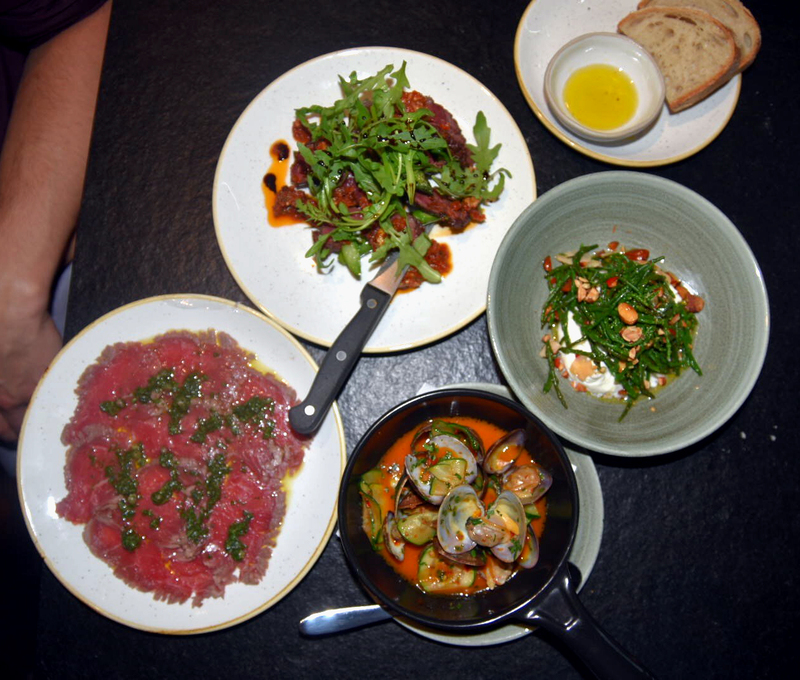 After a lot of yum-ing and ah-ing, we ask for suggestions from our lovely waiter, who steers us towards the Beef carpaccio, salsa verde, capezzana olive oil and the Burrata, samphire and almond salad. We take his advice and add the Onglet steak, English asparagus, sun-dried tomato and walnut dressing as well as the Gower clams, nduja, courgettes and samples of Scottish Ewes Cheddar and Hot smoked pork belly from Wales, accompanied by Sourdough bread. On our host, Chris’ recommendation, we try the Wines of the Week – a full, ruby coloured Chateau de Santenay Mercurey Rouge 2014 with fantastic structure and an abundance of rip red fruit, and an elegant, balanced Pouilly-Fuissé with fresh citric qualities and a touch of minerality – quaffing away whilst we natter amongst ourselves and wait for our first dishes to arrive. Before we know it, we’ve made our way through our glasses and peruse the list for a second glass (for one cannot have cheese without wine). The white is less successful than the first and lacks any interest on the palate other than a so-called “prickle of fizz”, but the Rioja is a gloriously hench (yes, we just called a wine hench) and blackberry-led discovery with legs for days. The cheese arrives, served with pineapple and chilli jam, along with the glistening ribbons of pork dressed in pickled cucumber and bitter leafage. The ewes cheddar is smooth, creamy and lightly crumbly. The jam works wonders alongside it and is not overly sweet with the slightest hint of heat and a gentle spice. The hot smoked pork belly is robust and flavoursome and not miss to be missed. As our empty plates are collected, we take a moment to do some people watching. There’s a lively buzz in the venue and diners are couples or small groups. 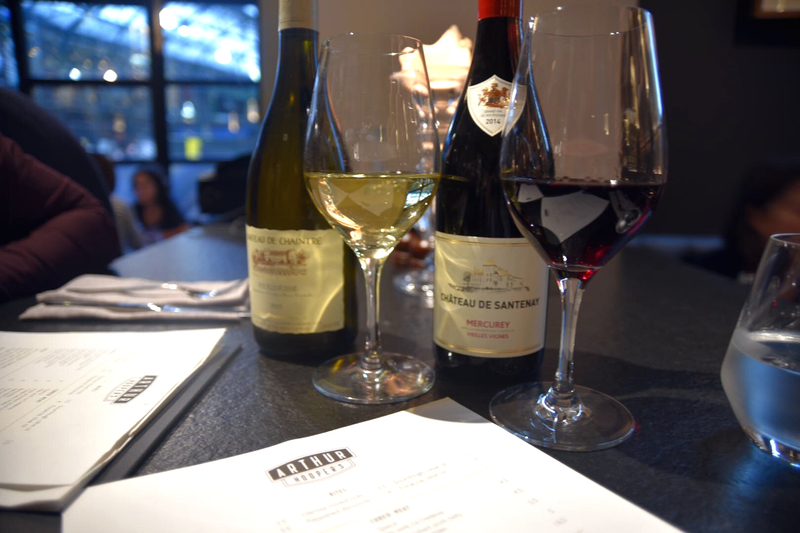 The service is slow but dedicated with friendly staff on hand to answer any questions; this is not somewhere to arrive hungry to but is perfect for a leisurely catch-up with a friend over a few glasses of wine or a promising first date. After a little while, our mains arrive and they prove to be well-worth the wait. The onglet is served perfectly medium-rare as requested, sprinkled with crunchy walnuts and covered with sundried tomato, slices of blanched asparagus and rocket that has been lightly splattered with balsamic reduction. The clams are served in an incredibly powerful nduja sauce with thin rounds of courgette, whilst the carpaccio is beautifully soft and delicate in flavour. Lightly garnished with fresh salsa verde and dotted with capers, it is a refined and pleasant dish. However, our favourite by far is the burrata with samphire, garlic, roasted almonds and flecks fresh of chilli. 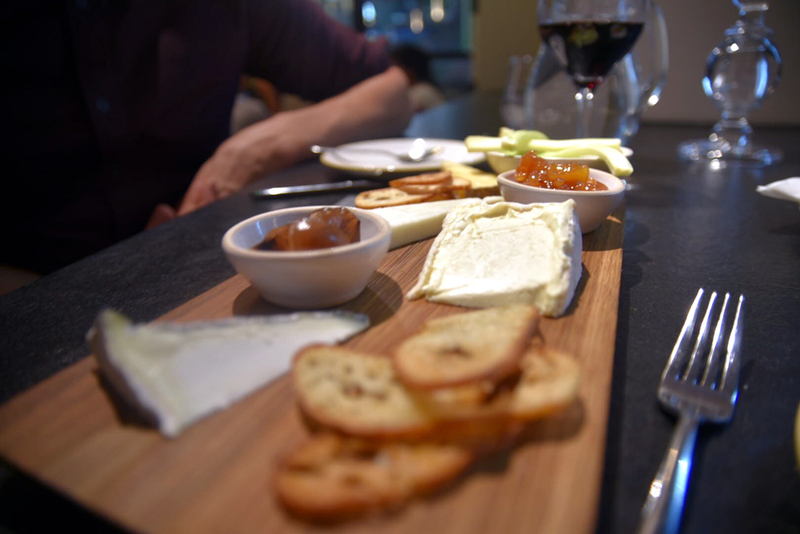 The cheese is almost liquid in its smoothness and truly exquisite. Tender garlic plays with the crunch and woodiness of the nuts and the samphire adds a touch of saltiness and textural intrigue, as well as a slight bitterness that compliments the cheese’s sweetness. Everything that has passed our lips so far is of exemplary quality in terms of ingredients and preparation, and we eye-up the three dessert choices with a mixture of longing and indecision. We settle on the Chocolate Hazelnut Pot with Hazelnut Crispies and the Cheese Selection. The cheeseboard features a young but stunning triple cream Brillat Savarin, a rich and musky goat’s milk Tor, a hard, almost dry Cornish Blue that has a bit of bitterness to it, and the Ewes Cheddar. Pickled shallots keep our palates vitalised and, to our delight, the pineapple chilli jam makes a second appearance. 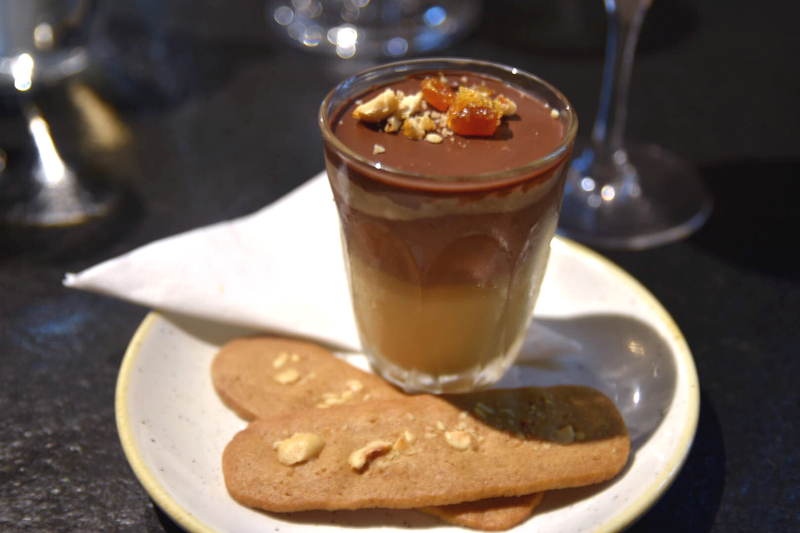 The chocolate pot with soft gelatinous hazelnut is smooth and enticing and is accompanied by a pair of spiced ginger biscuits for dipping. This final morsel provides a rounded end to a wonderful experience. Chris tells us how when they first opened, it took a little while to get busy but since the horrendous attack on the area in June of this year, people have been wonderful at supporting local businesses and getting the word out about them. Once they’ve dined here, the food, wine and staff are sure to bring them back for more. For more information about Arthur Hooper’s, visit their website here.